We’ll Make Your Home Allergy-Free Again. Carpets trap thousands of different types of allergens. It is important to have your carpets and rugs cleaned regularly to maintain a healthy indoor air quality and to improve the well being of your family or employees. Allergies on are the rise and can greatly affect the development of children. Our air is full of potential contaminants which all settle into your carpet. Make sure they are removed on a regular basis with a thorough carpet cleaning by the pros. Dust is a natural part of our world and it occurs indoors as well as outdoors. With today’s efficient homes, we have a lot more dust trapped inside. That dust can cause respiratory problems when it is airborne. When it settles into carpet it can help grow mold and other macrobiotic organisms. It it recommended to clean the carpets in your home once every six months. At ServiceMaster our state of the art technology and techniques remove the maximum amount of dust. Our truck mounted extraction units spray pressureized hot water down to the backing of your carpet and then immediately remove it with a powerful vacuum leaving nothing but a clean carpet. Pets drag pollen, mites and other organic materials such as dirt and mold into your home from the outside. Their fur and dander can stay embedded in your carpet. Even if you don’t see that material, it is there. Children and seniors tend to be the most susceptible to negative health affects of allergies. 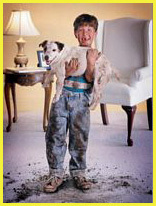 By taking care of your carpets, your are taking care of the people around you. Many people work in an environment that isn’t 100% sterile. We all bring back materials from that environment to our homes. It can be carried on our shoes and clothing, on our hands and in our hair. For those people working in manufacturing or in an industrial environment, the materials they bring home can be a cause for concern for developing children. It is best to wash clothes thoroughly and to have carpets cleaned regularly in order to ensure a safe living environment. We have been serving Southern and Central Maine for over 25 years. Let our family of service technicians help make yours a happy home.